We specialize in the processing of Ready to Eat Food. We offer tasty and delicious food items such as Samosa, Wada, Paratha, Naan, Kulcha, Thalipith, Puran poli along with traditional Aluwadi, Kothimbir wadi and several other mouth watering items. These Ready to Eat Food items are quick to cook and tasty to eat. Daulat Agro (india) Pvt. 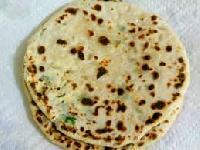 Ltd.
Kulcha is similar to Indian chapattis. It is specially baked. It is garnished with Spinach/Corianders leaves/Mint leaves. 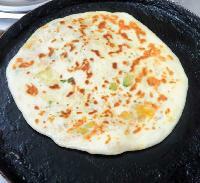 Our Kulchas are suitable to be eaten with cooked vegetables or non-vegetarian dishes. 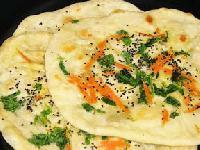 Kulcha is a type of mildly leavened flatbread, an local variation of naan extremely popular in Delhi, and Punjab. 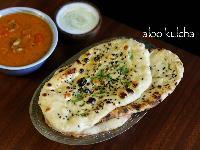 Kulcha taste good with all the Punjabi dishes. While many believe that it's quite tricky to prepare chole, it's even tougher to prepare the perfect Kulcha. 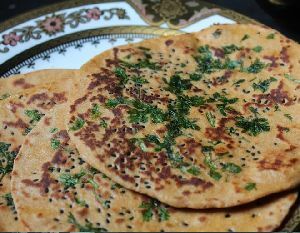 To combat this Harvest Gold has introduced the Kulcha Bread in Delhi NCR, which has quite rapidly become popular among all age groups. 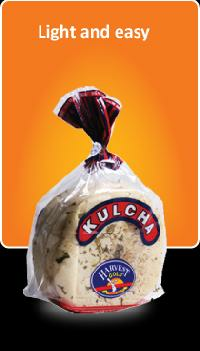 So now get ready to enjoy tasty Kulchas from Harvest Gold anytime of the day.